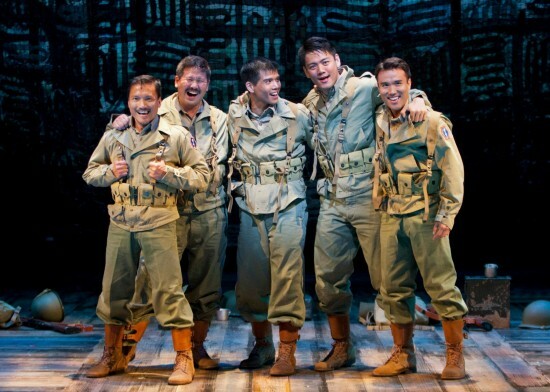 SAN DIEGO — “Allegiance,” a new musical about the World War II internment of Japanese Americans, had its opening night Wednesday at The Old Globe in San Diego, and the local reviews are in. U-T San Diego’s James Herbert said the play “finds just the right balance of lyricism, heartbreak, yearning and, yes, humor. Most impressive of all, this original work manages to thread together myriad themes — of family strife, politics, patriotism, racial prejudice — into a beautifully unified exploration of what it means to be true to something. It’s not just about allegiance to one’s country, but also to a cause, and to loved ones, and ultimately to one’s self. Pam Kragen of The North County Times wrote, “As new musicals go, ‘Allegiance’ is in impressively polished shape, with a multilayered, clearly plotted, well-paced book. And Kuo’s score is refreshingly different, with unusual and sweeping, Asian-inspired melodies, all lushly orchestrated and arranged by Lynne Shankel. 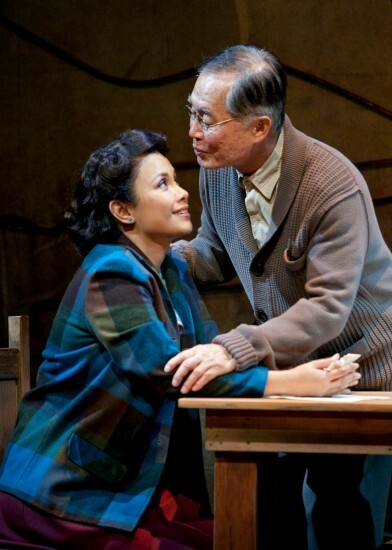 The play, which also stars George Takei and Telly Leung as the older and younger Sam Kimura, takes place in the Heart Mountain internment camp. When the loyalty oath is imposed, Sam and his sister Kei part ways when he is persuaded by JACL leader Mike Masaoka (Paolo Montalban) to join the Army while she falls in love with Frankie Suzuki (Michael K. Lee), who leads a protest against the violation of the internees’ constitutional rights. Saturday, Sept. 22 and 29, Oct. 6, 13, and 20, at 2 and 8 p.m.
Sunday, Sept. 23 and 30, Oct. 7, 14, and 21, at 2 and 7 p.m.
Tuesday and Wednesday, Sept. 25-26, Oct. 2-3, 9-10, and 16-17, at 7 p.m.
Friday, Sept. 21 and 28, Oct. 5, 12, and 19, at 8 p.m.
For tickets, call (619) 23-GLOBE (234-5623), email [email protected] or visit www.TheOldGlobe.org. The box office is closed Mondays and open Tuesday through Sunday from 12 p.m. to performance time. 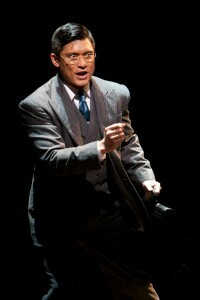 For more information on the show, visit www.allegiancemusical.com or www.facebook.com/allegiancemusical.